VENTURA COUNTY, Calif. – A brush fire broke out today in the 25000 block of WOOLSEY Canyon Road and in the area of E Street and Alfa Road. This is in northwest San Fernando Valley between the City of Los Angeles, Chatsworth and Simi Valley. Two wildfires: WOOLSEY FIRE and the HILL FIRE are burning about five miles apart from each other. (Note: We are covering them as separate wildfires but may have both referenced in a single post). Fire conditions are reported as very dry with winds getting stronger overnight. The relative humidity is also very low, meaning there is no change of precip in this forecast. 1421 PST: The fire has increased the destroyed acreage to 750 and growing quickly. There was no containment status at this time. The fire was said to be still a big threat to Los Angeles County. 1424 PST: COPT21 reports approximately 5+ acres with rapid rate of spread with structures threatened. Winds 25-30 mph. 1426 PST: Air Attack was reported as requesting four large air tankers and a lead plane as an urgent need for structure protection. 1429 PST: P73 reported heavy smoke showing from a distance of .25 miles. A Security Guard advised the area is being impacted two separated wildfires. The two wildfires are the WOOLSEY FIRE and the HILL FIRE. 1452 PST: Social media users posting traffic updates. Portion of 101 is closed. Estimated traffic travel is 4 hours to reach the Pacific Coast Highway also known as the PCH. 1500 PST: Those following scanner feed reported the fire has burned 50 acres and burning in medium-heavy fire fuels with a rapid rate of spread to the south to west towards Oak Park. It has been observed to have long-range spotting. 1524 PST: Scanner follower reports IC states fire has burned 600 acres. 1541 PST: South Ops advises no more available air tankers. 1616 PST: Aviation buffs following aircraft signatures through various apps showing the Super Scooper, the VLAT (DC10) and other smaller air tankers fighting fire on both wildfire incidents. 1712 PST: Scanner feed followers are reporting structures in the Bell Canyon are under imminent threat. Two (2) immediate Type 1 strike teams requested to this area. 1736 PST: BC589 reporting fire has now burned 800+ acres and still remains at a zero percent containment. Homes in the Bell Canyon area are under direct threat. 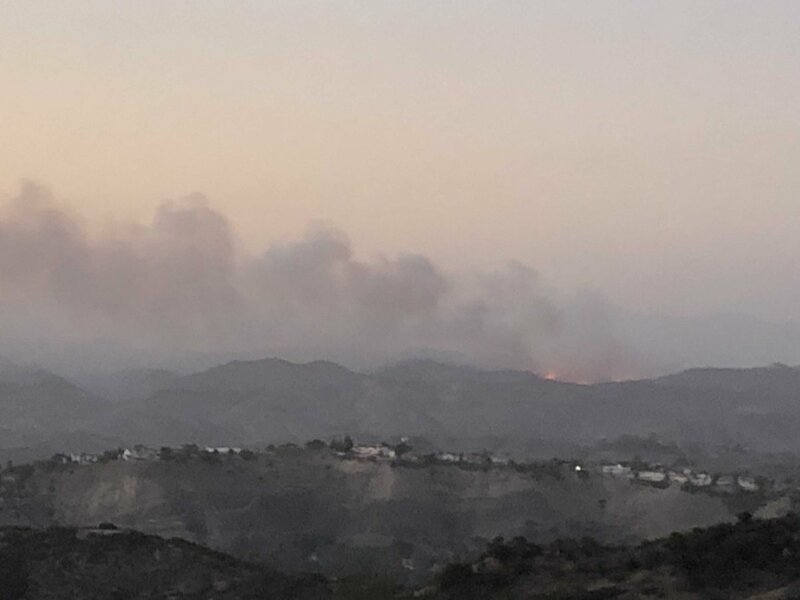 Fire is moving in the direction of the Ahmanson Ranch in the Agoura area, which is in the jurisdiction of LA County Fire Department. Video Credit: Michael Dubron @MichaelDubron with the LA County Fire Department. 1906 PST: Three wildfires are now burning: CAMP FIRE, WOOLSEY FIRE, HILL FIRE can be seen on NOAA sat maps. 1915 PST: Multiple posters stating the fire has burned from 1500 – 1600 acres and increasing. 2012 PST: Social media in LA County that follows the Fire Department reports: “Fire under command of Ventura County FD. Reporting fire is at 1500+ acres (some mainstream media reporting up to an unconfirmed 2,000 acres). 0% containment. LA Co FD has many resources engaged in the fire fight and more ready to provide structure protection in the LA County if needed. 2025 PST: Social Media users (and mainstream media) reporting one of the wildfires is threatening fuel gantries at the Rocket Dyne site. This was reported previously by many news organizations as possibly being the nation’s worst nuclear meltdown. Some are saying that Mall of America is wanting to raze the property for development. Others say that clean-up has been delayed many times to the possibility of not seeing the site completely denuclearized/cleaned up until the year 2030. Fire is said to be near the area causing fears of how this will impact people downwind. 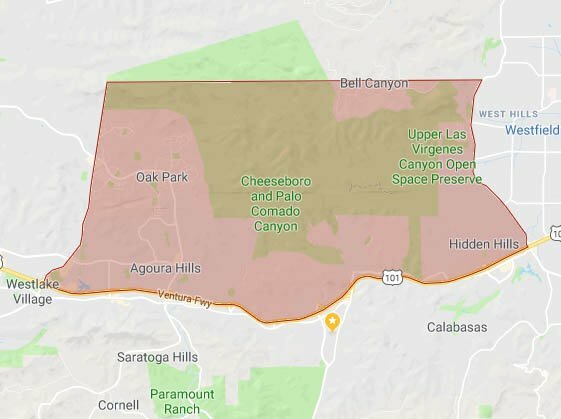 2023 PST –> Evacuation Map released by City of Calabasas. 1958 PST –> Evacuation Shelter Open in Camarillo — St. Mary Magdalen Church. 25 Las Posas Rd, Camarillo, CA. 1900 PST –> Evacuation Shelter Open for Simi Valley — Rancho Santa Susana Rec Center. 5005 Unit C Los Angeles Avenue, Simi Valley, CA. 1904 PST –> Classes Cancelled — All Senior classes have been cancelled at the Calabasas Civic Center and Founders Hall. Parking being shutdown. City of Calabasas — Image from Mountain Park off of Mulholland in Calabasas. Photo Credit: City of Calabasas.